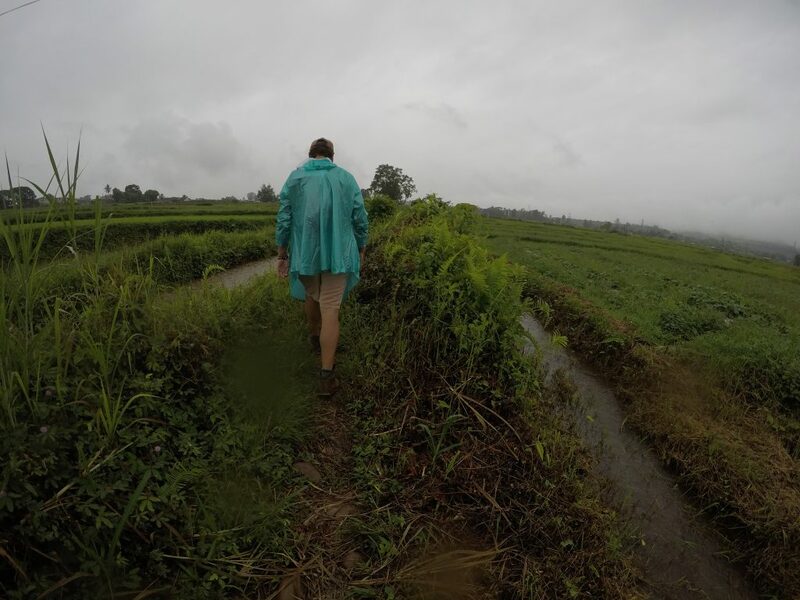 The hardest part of our time in Myanmar was waiting for us: Hsipaw, a town north east of Mandalay which is known for its beautiful multiple day jungle trekking. 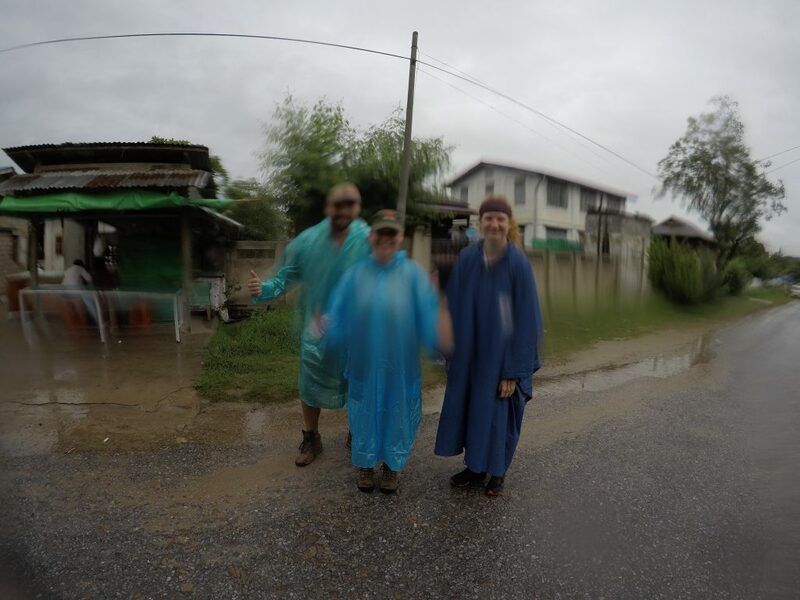 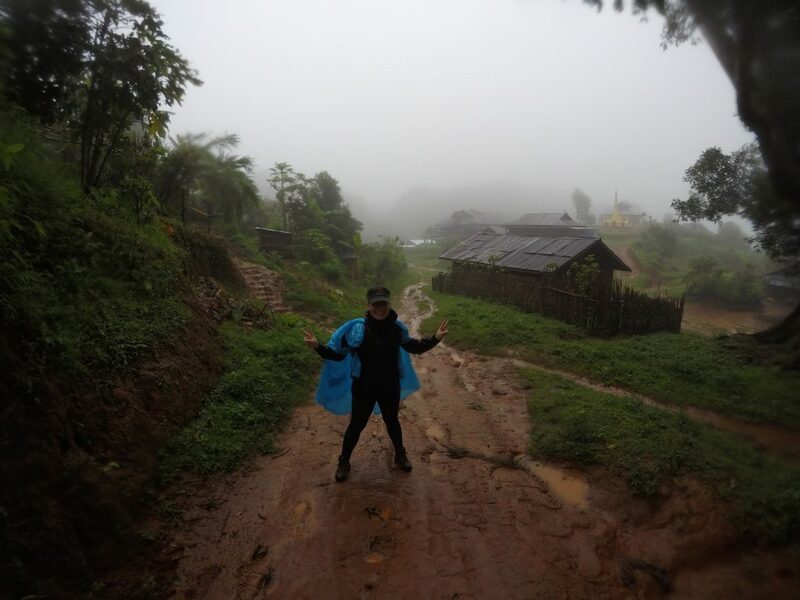 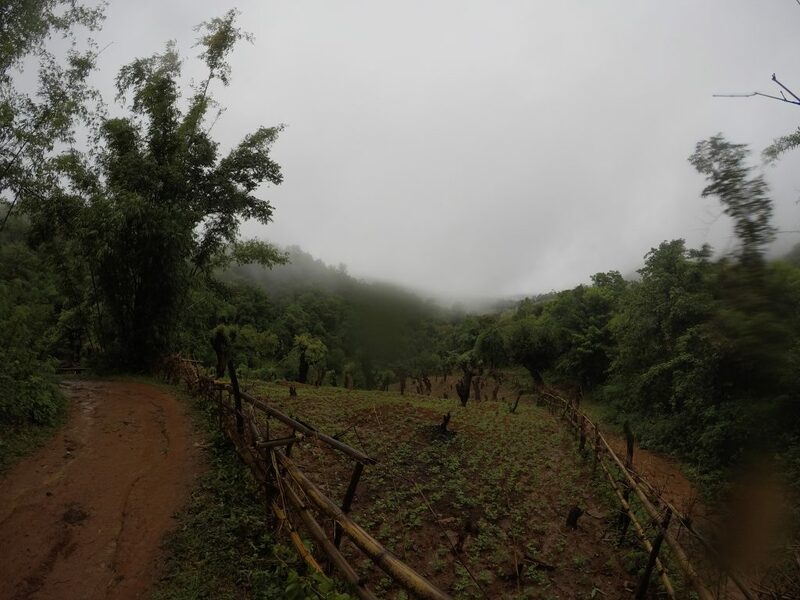 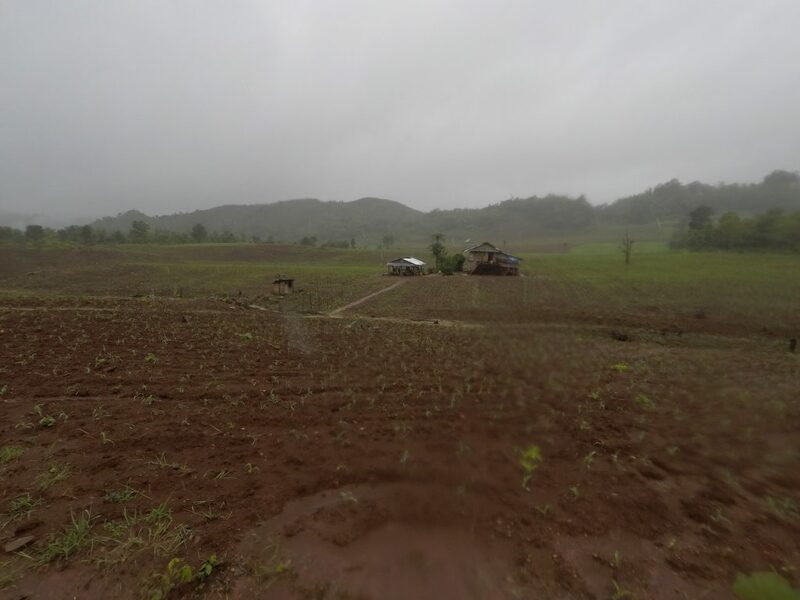 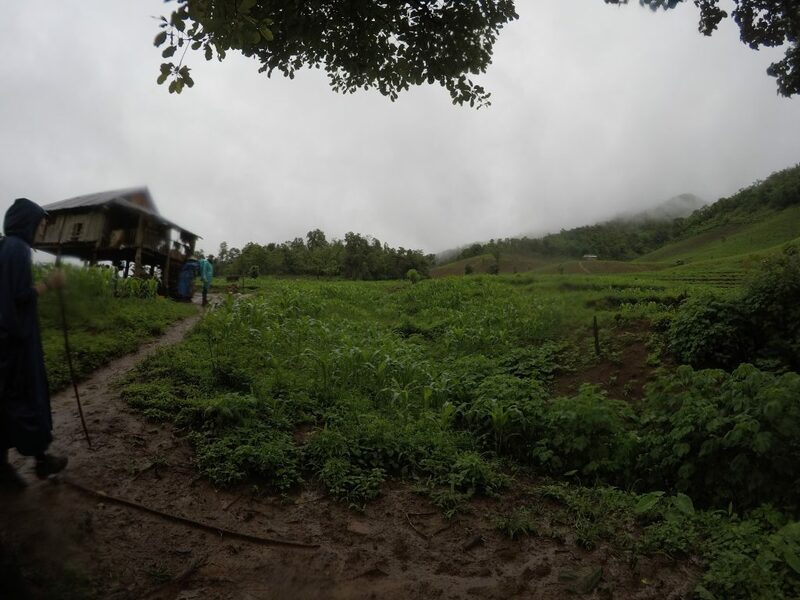 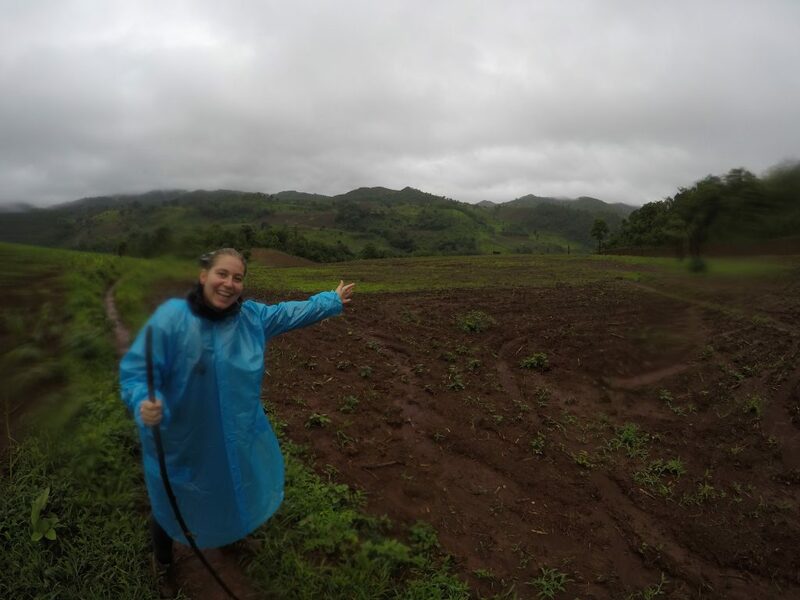 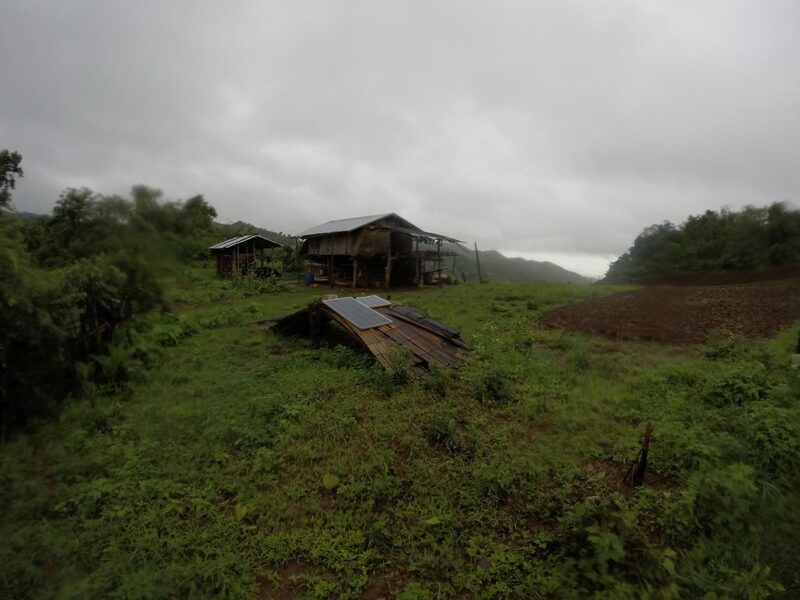 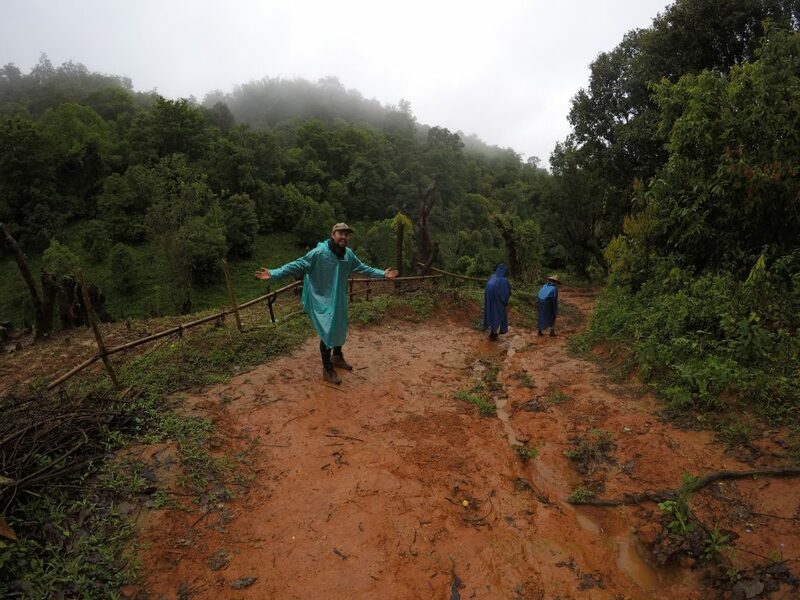 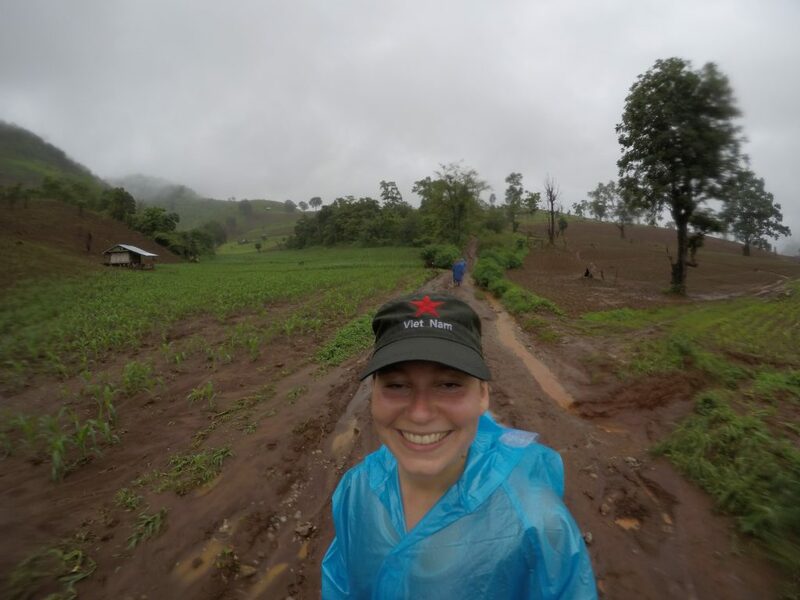 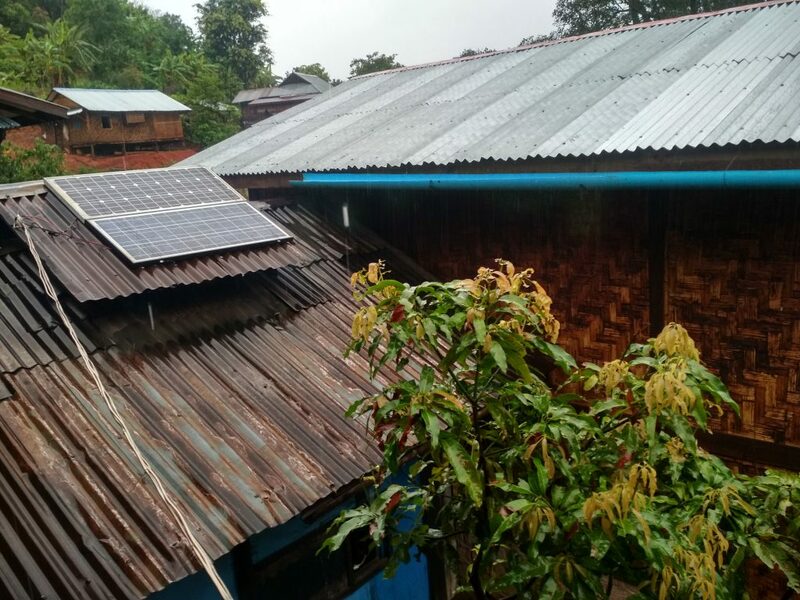 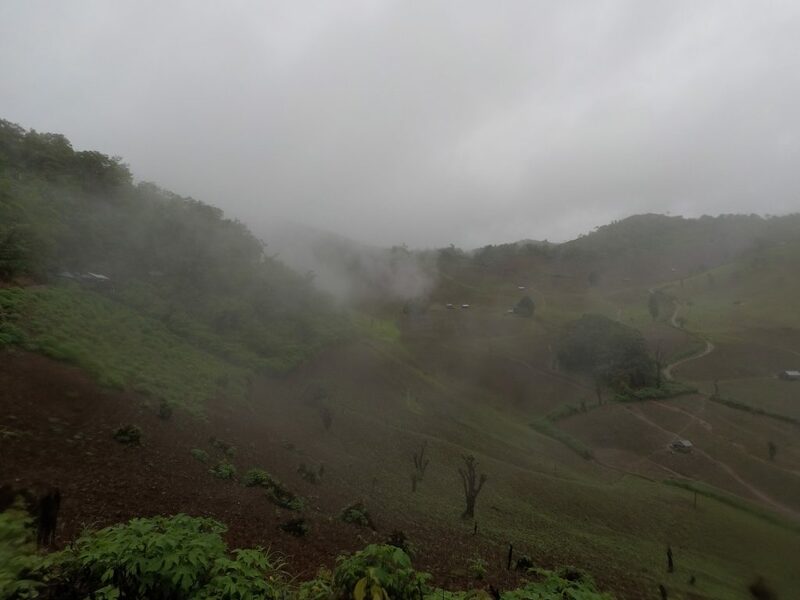 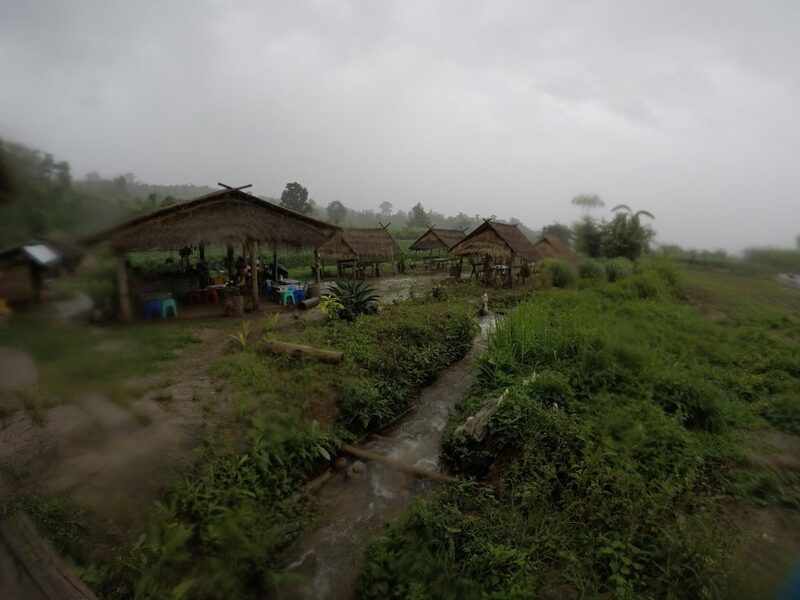 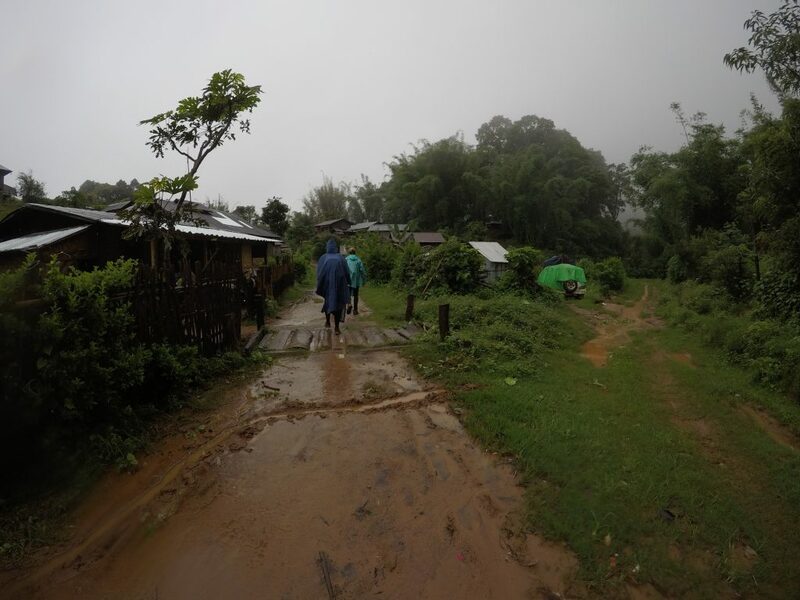 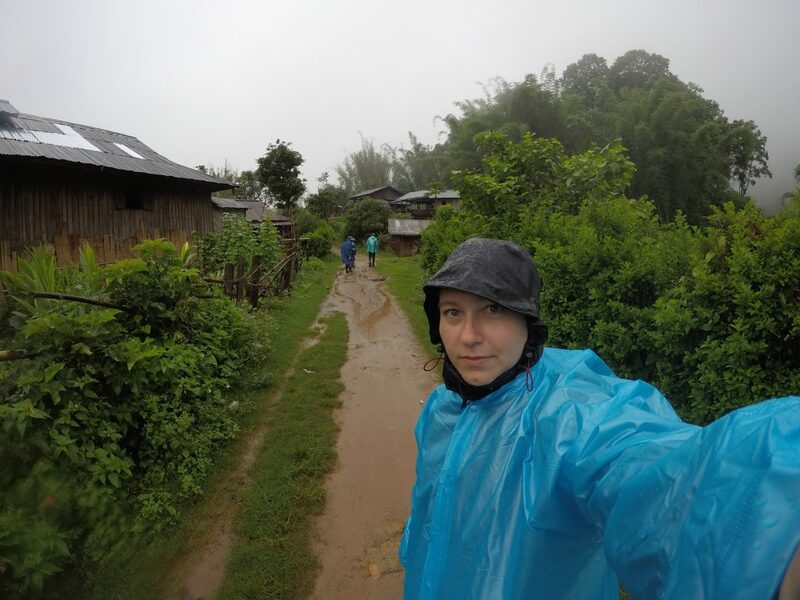 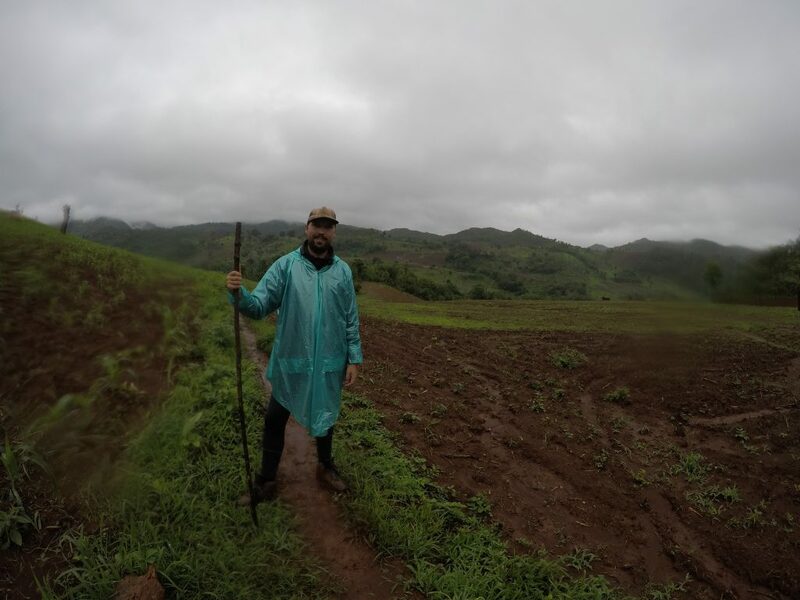 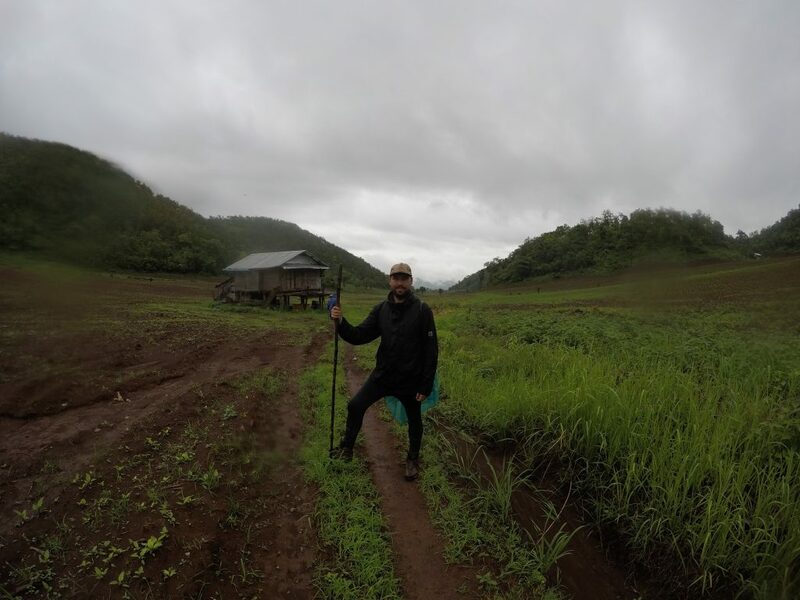 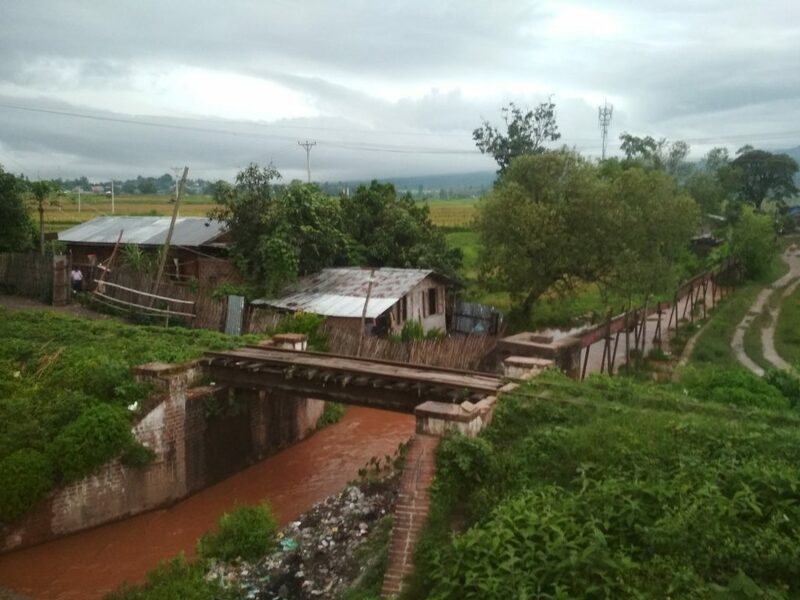 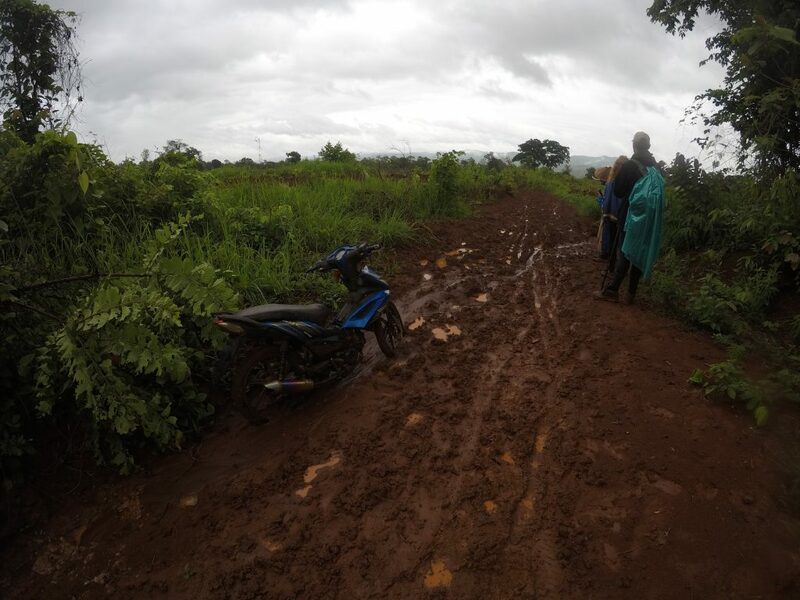 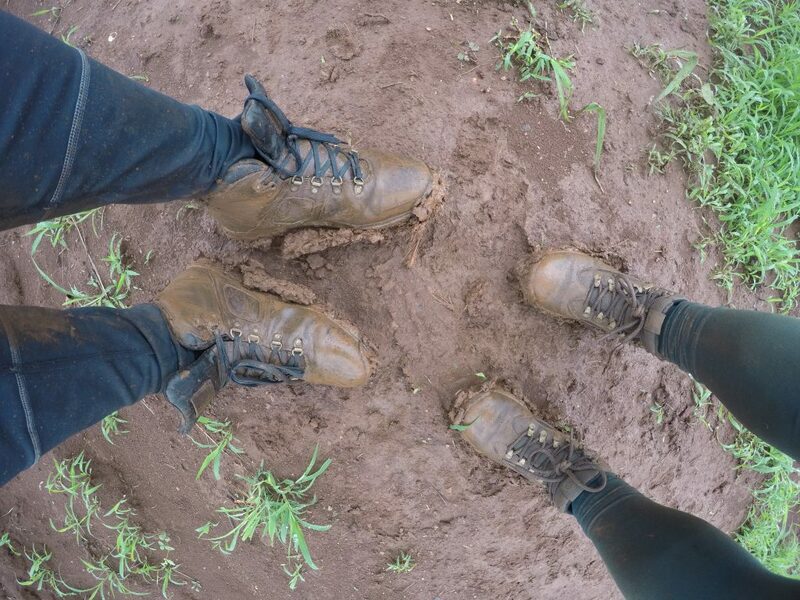 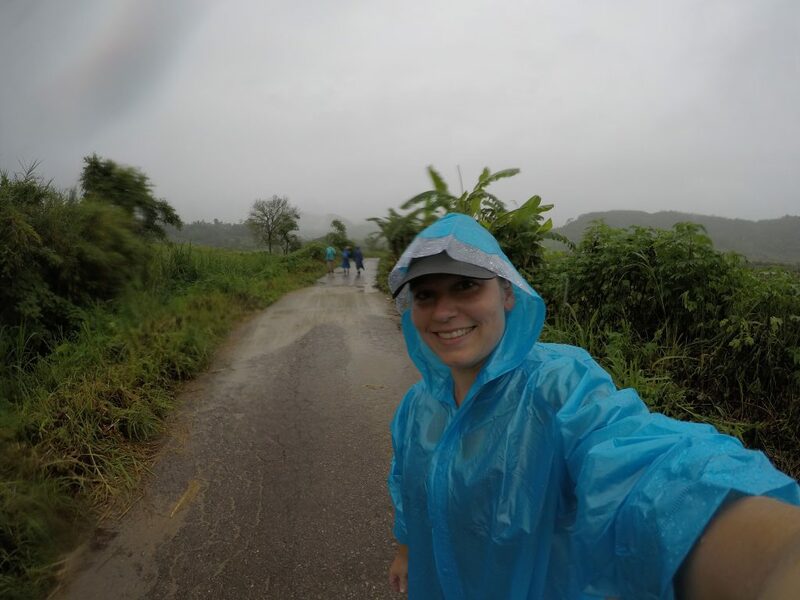 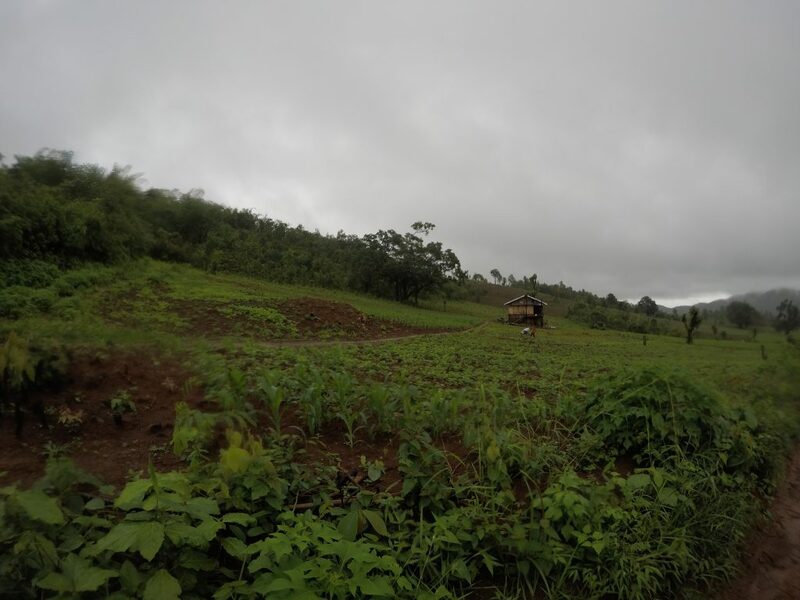 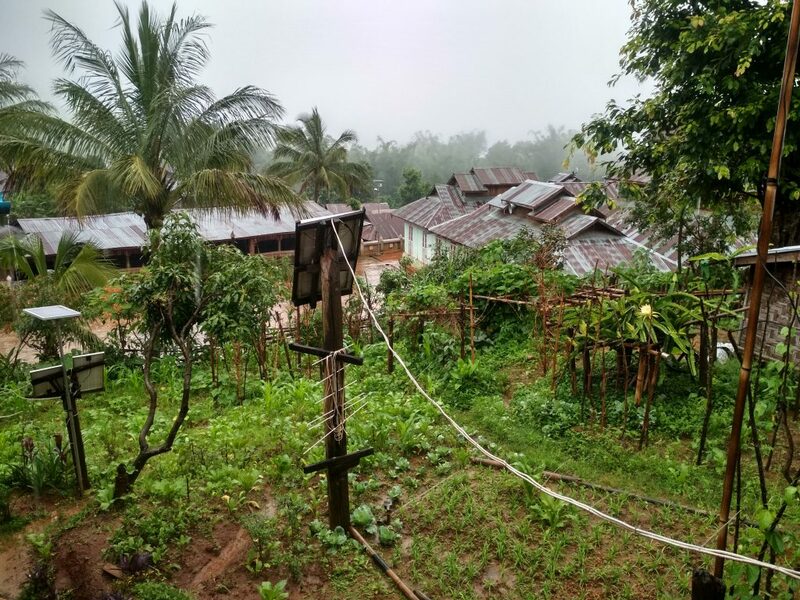 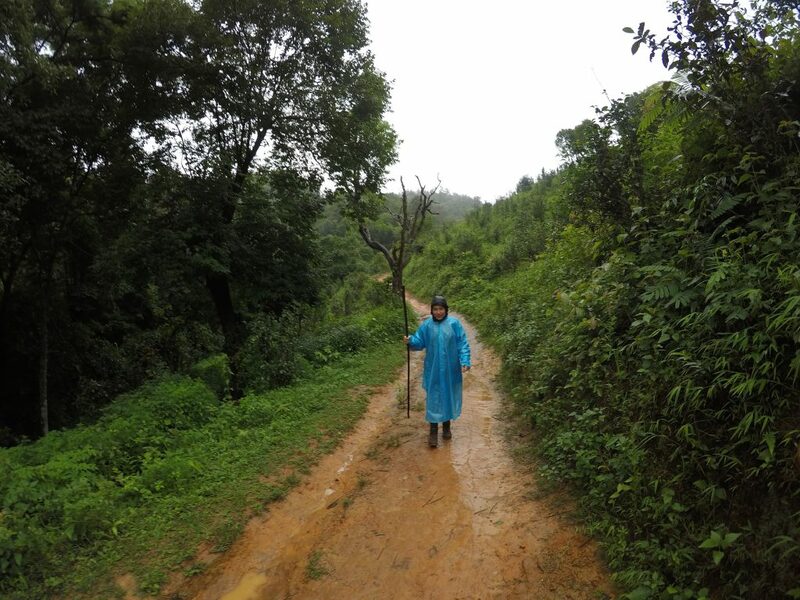 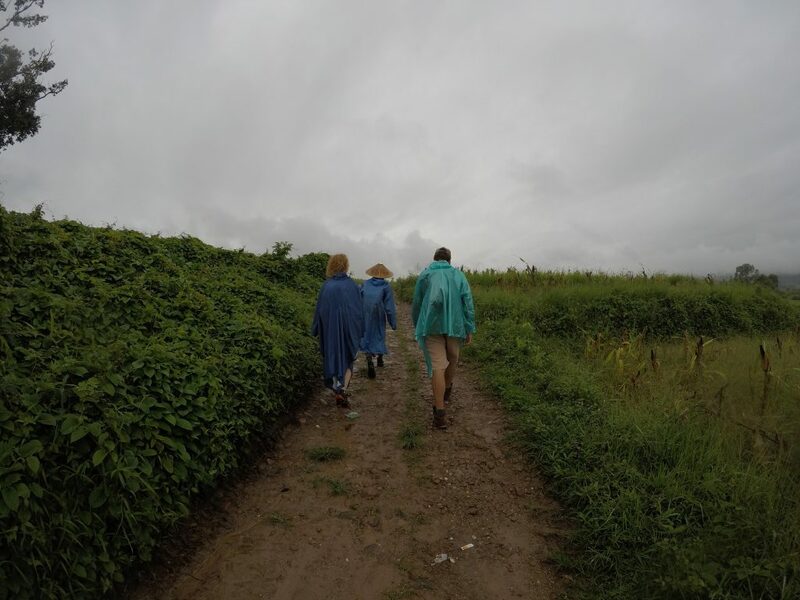 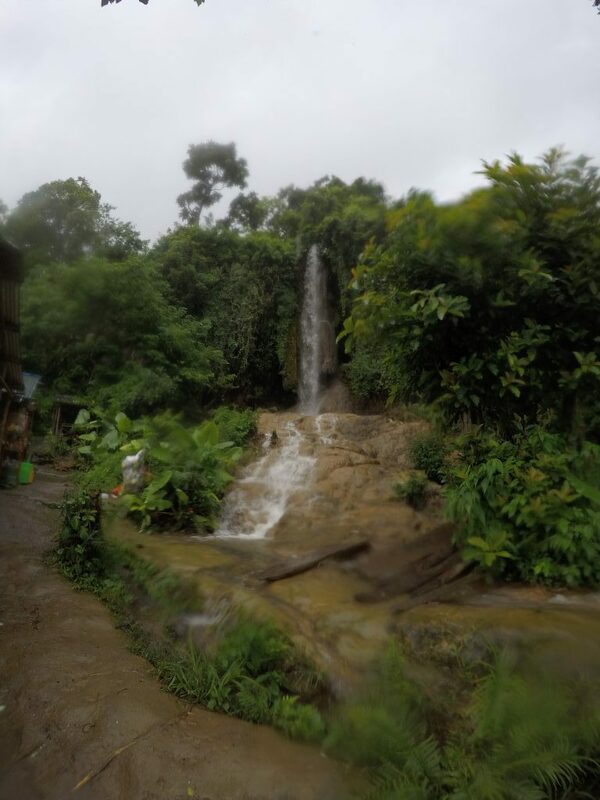 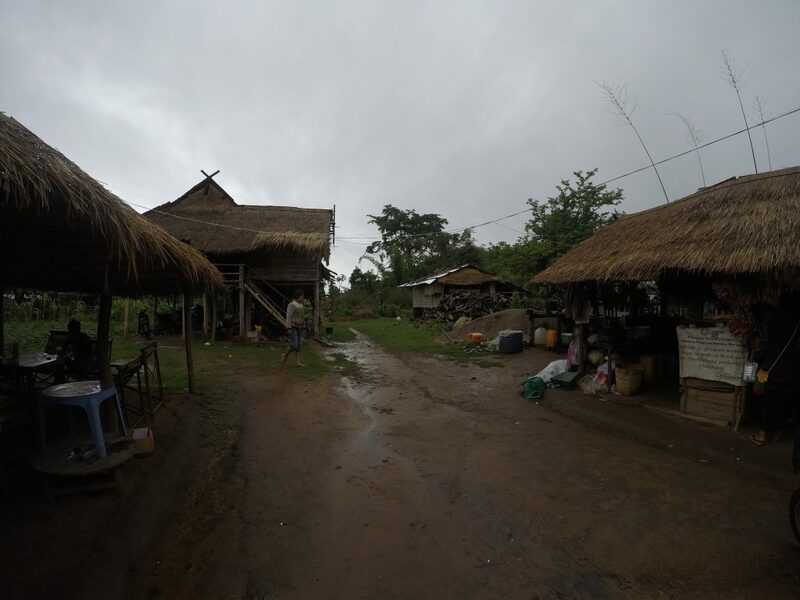 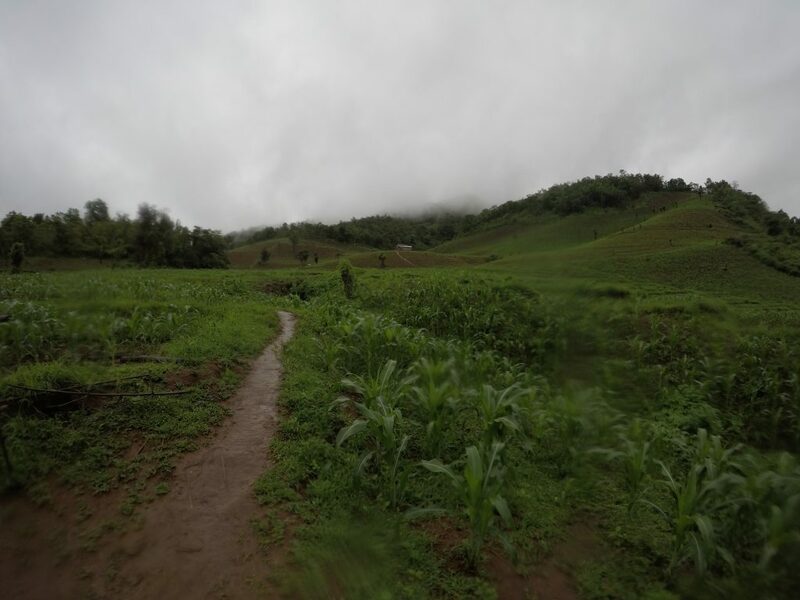 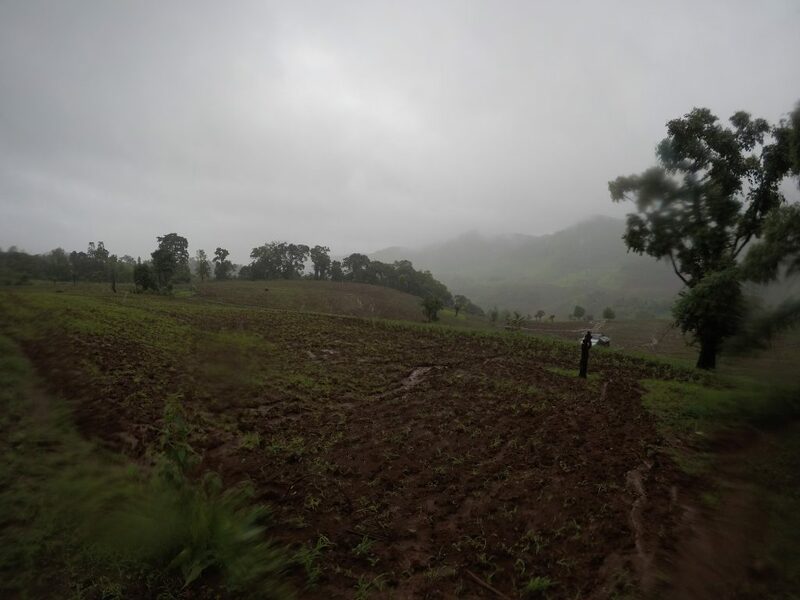 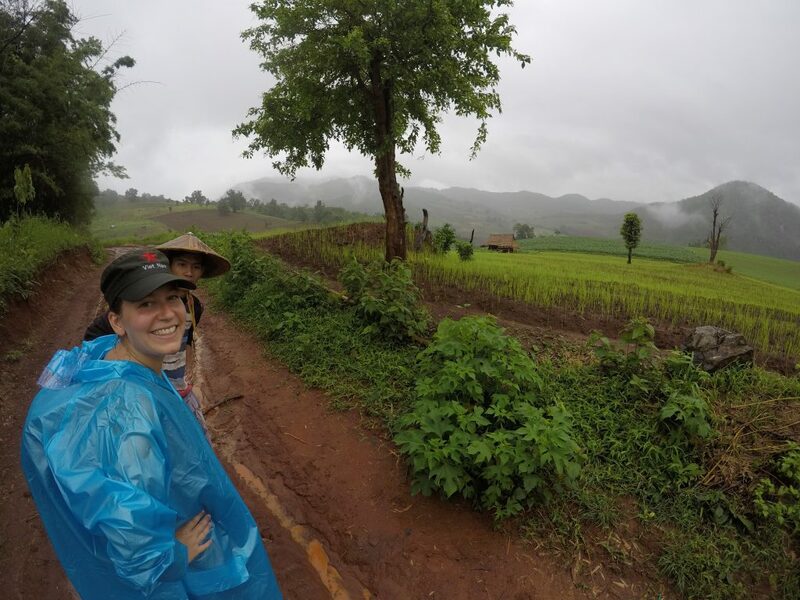 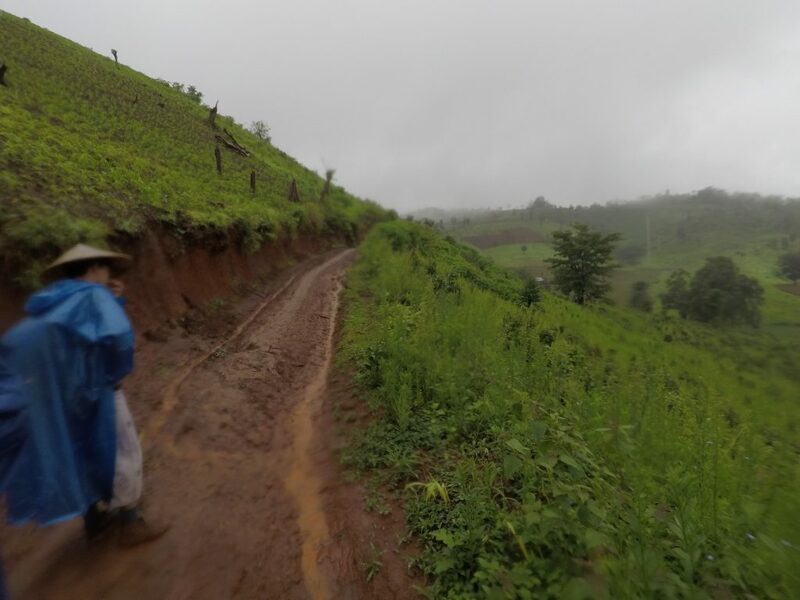 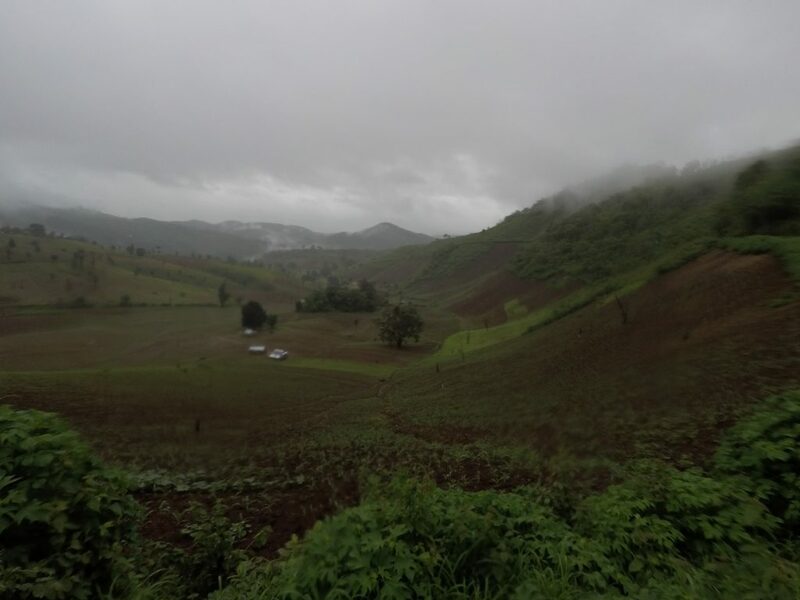 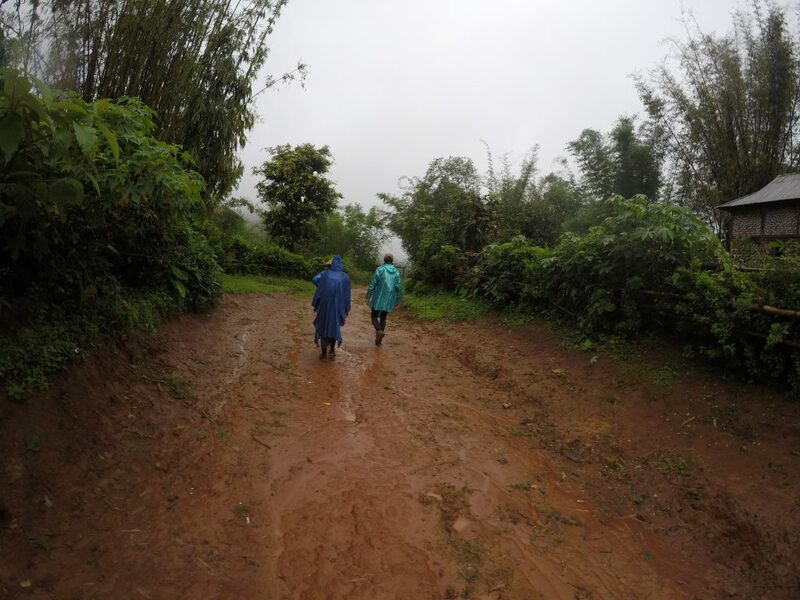 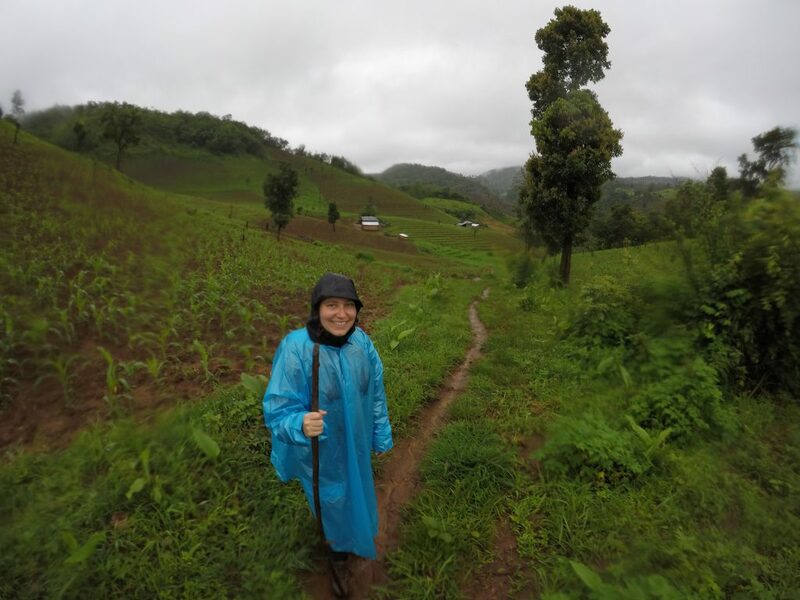 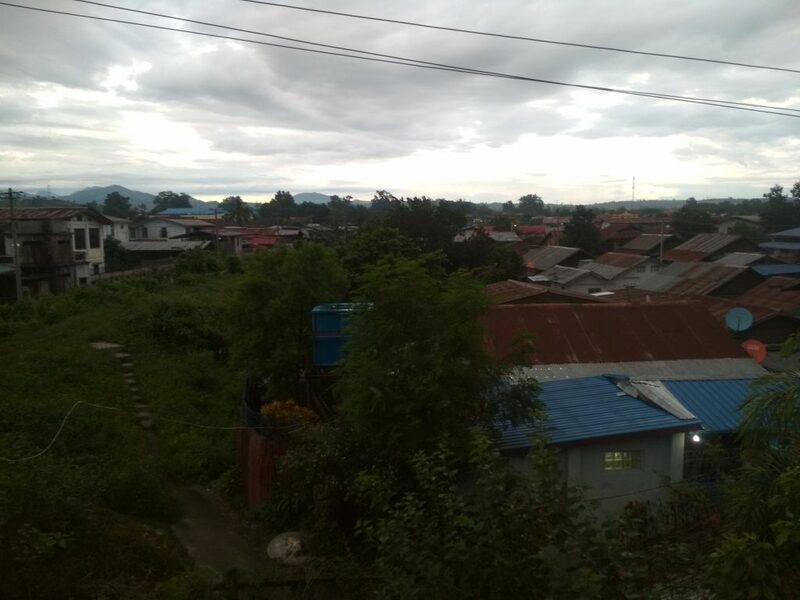 Originally, we planned to do a 3 day and 2-night trek, but the weather gods told us to better cut it down to a 2-day 1-night version, as rainy season hit us hard in Hsipaw. 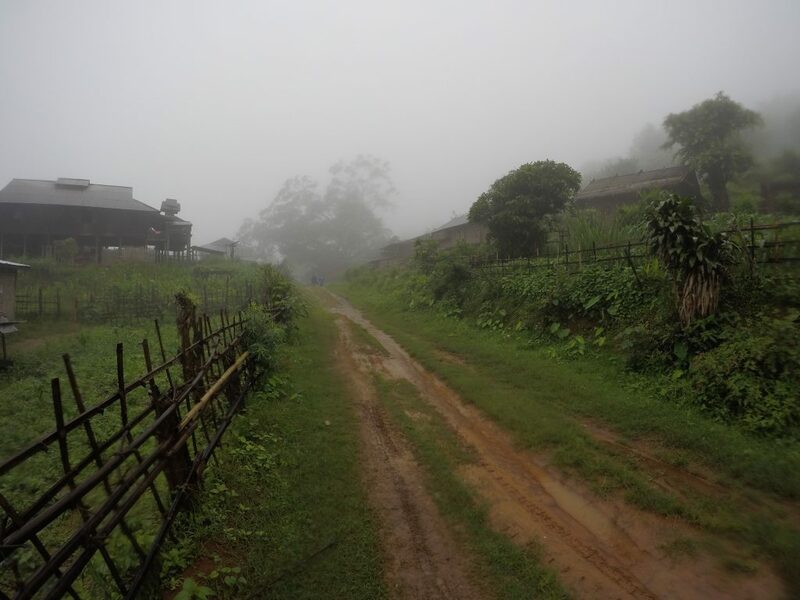 Early in the morning we started from the doorstep of our hostel for the trek, guided by a young and very friendly guy called Sai Han Mon. 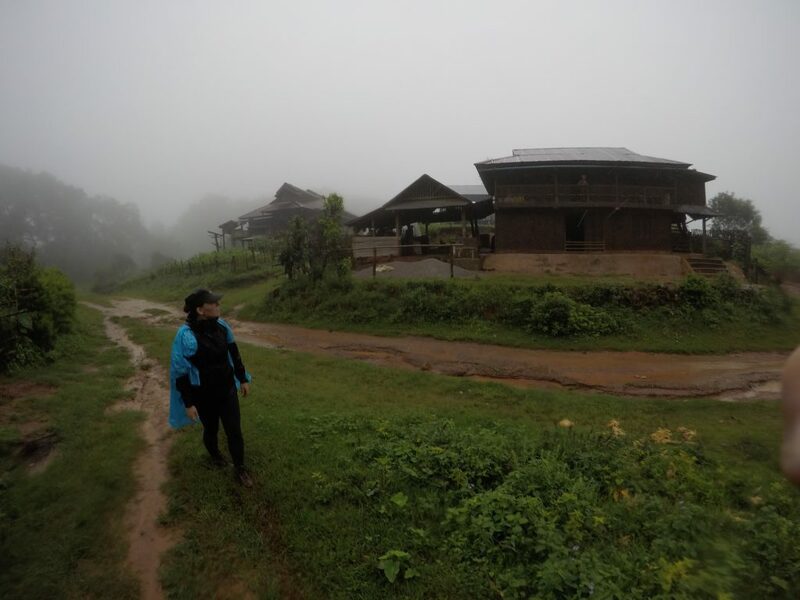 Sai was an English student, so communication wasn’t any problem and he taught us a lot about the area, nature, people and their culture of the small native villages we passed on the way. 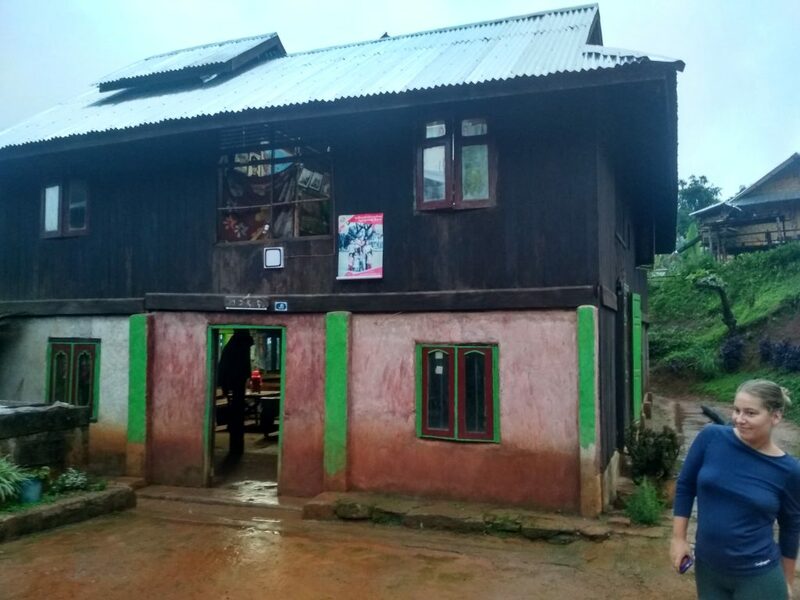 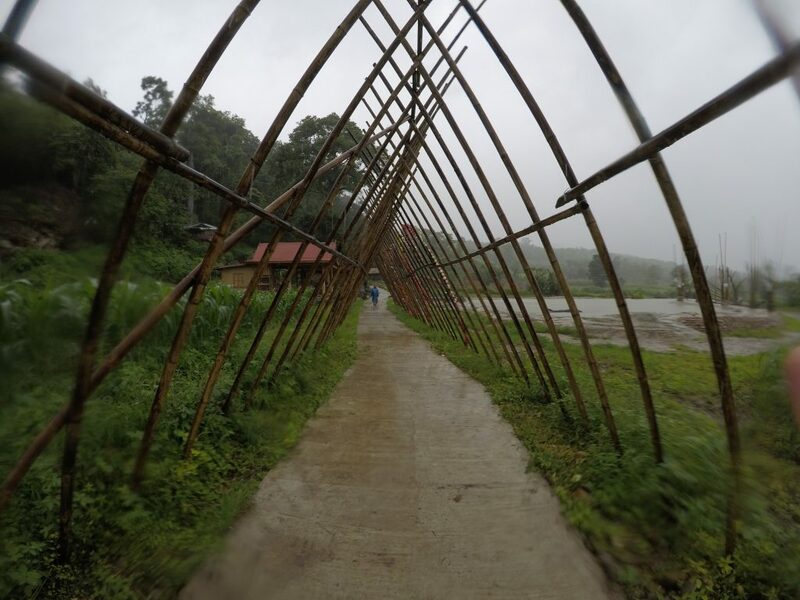 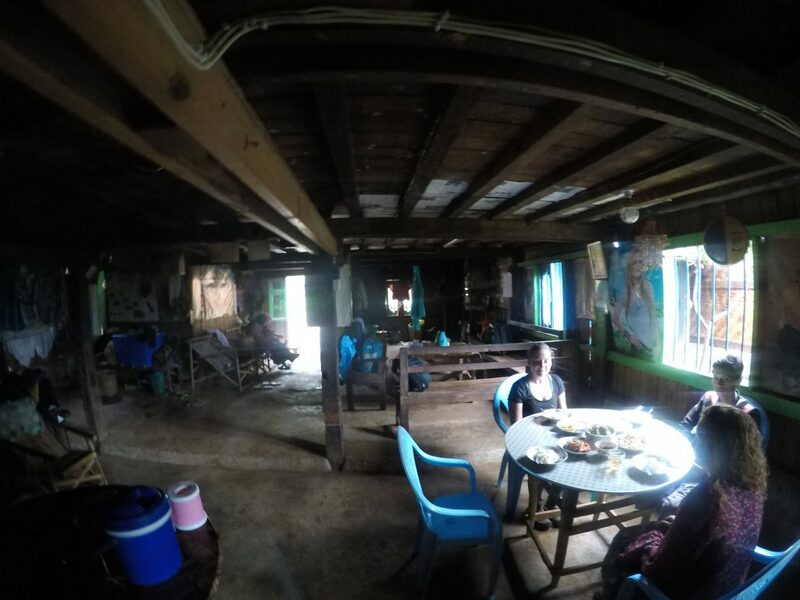 Our first day was about a 7 hour walk to Pankam Village, where we should spend the night in a homestay at. 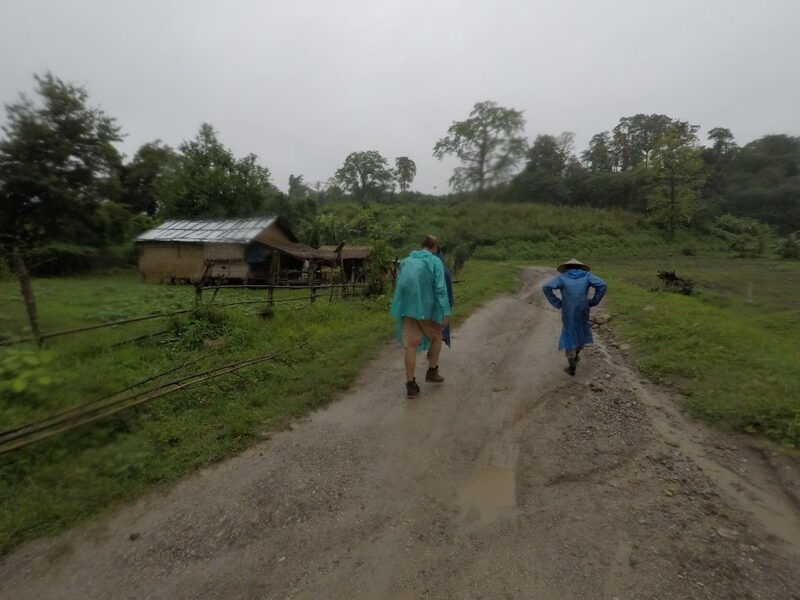 The walk was challenging, but not undoable, but it was more challenging to deal with the rain that didn’t stop for one minute. 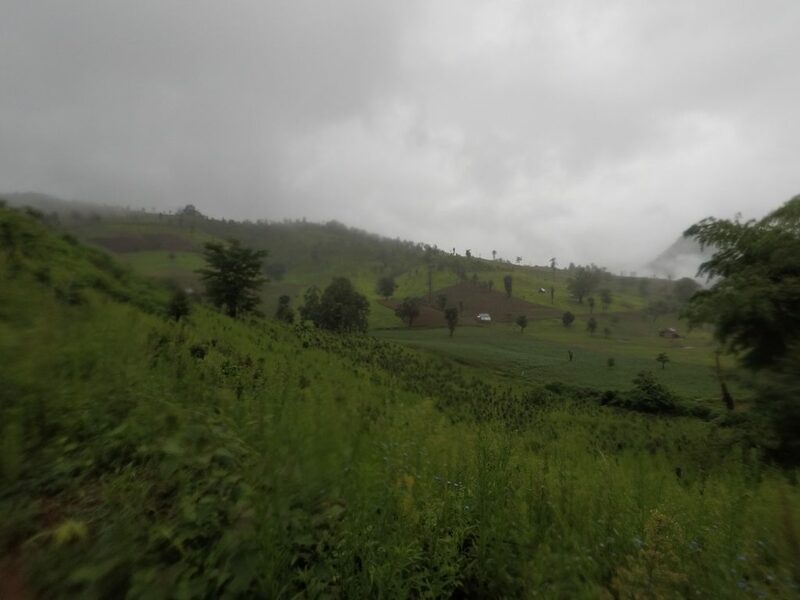 Still the scenery paid easy of for that. 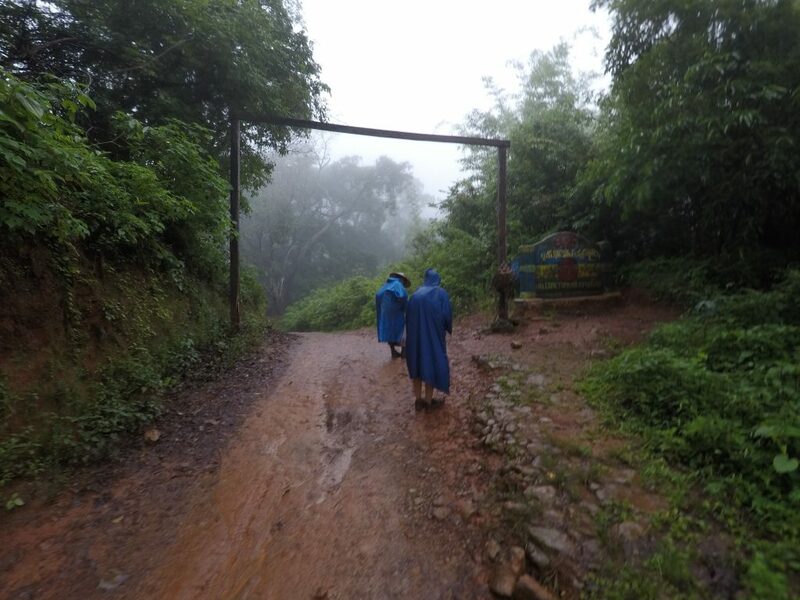 Arrived at entrance sign of Pankam Village, we felt like stepping into the Shire in Lord of the Rings. 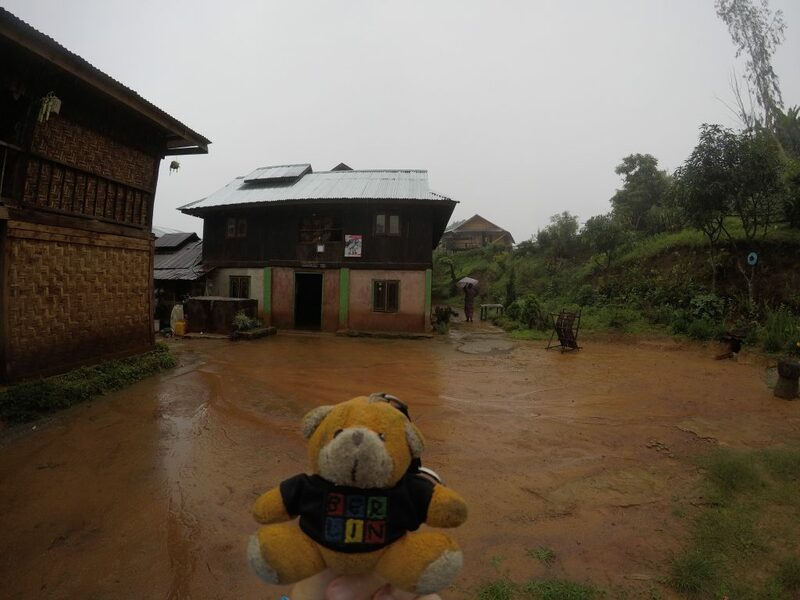 The last picture is of Buddy Bear was taken in Front of our place, which was basic, but very comfortable to stay at. 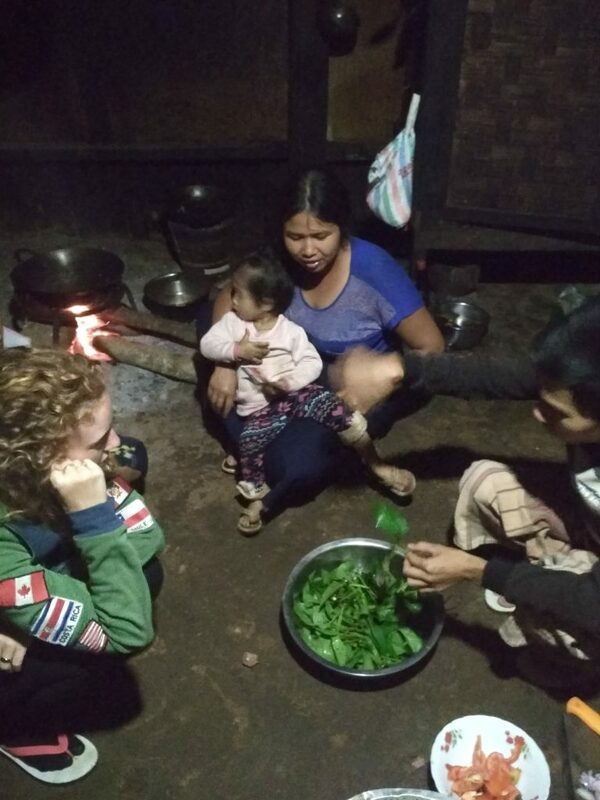 We had some delicious wood fire made food and played card games together with Sai until late and had some drinks. 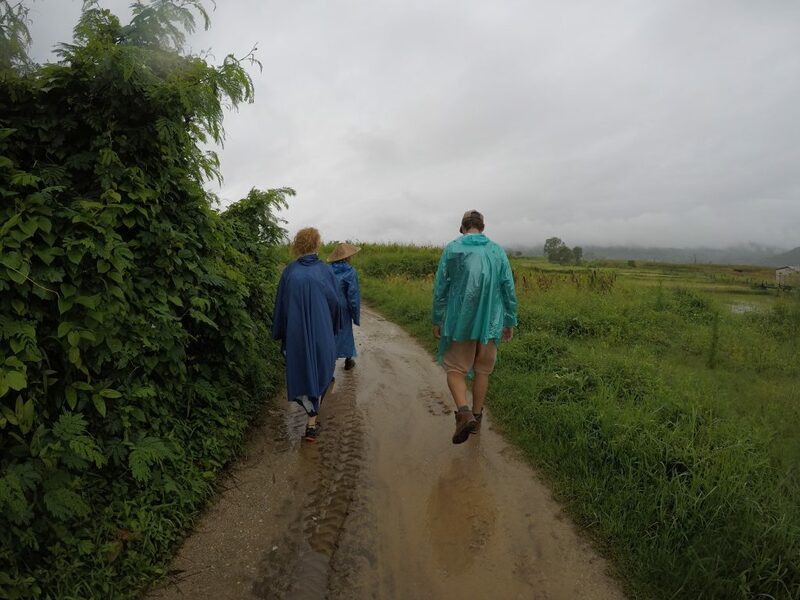 Next morning, we started early, and weather was kind of the same again. 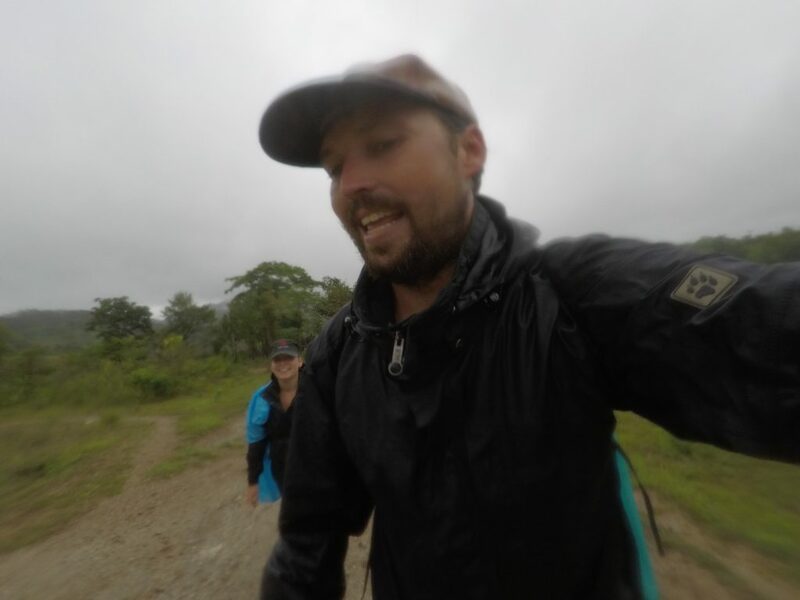 At least it stopped for about 1 hour during the 7-hour walk on that day. 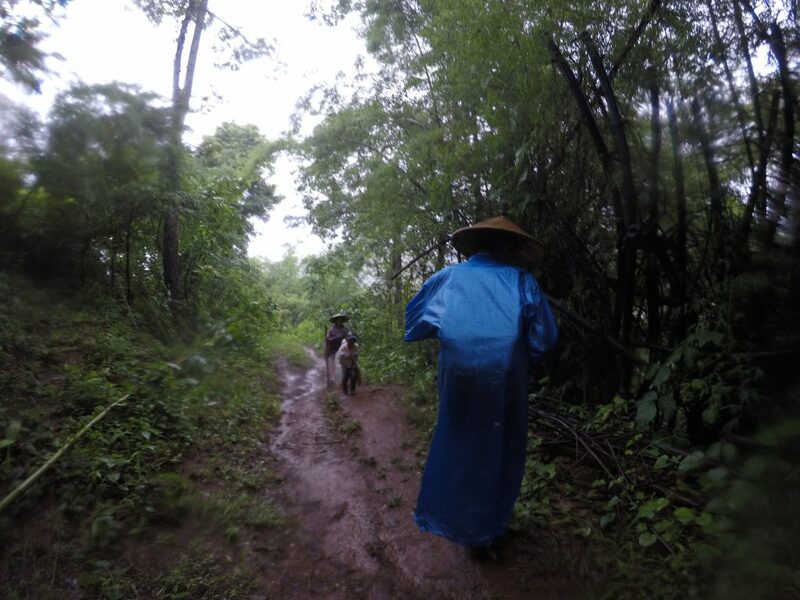 Where there was mostly still a quiet good track on the first day, the 2nd day was a real jungle track followed by a mud road that was more like mud battle due to the amount of fallen rain in the last day. 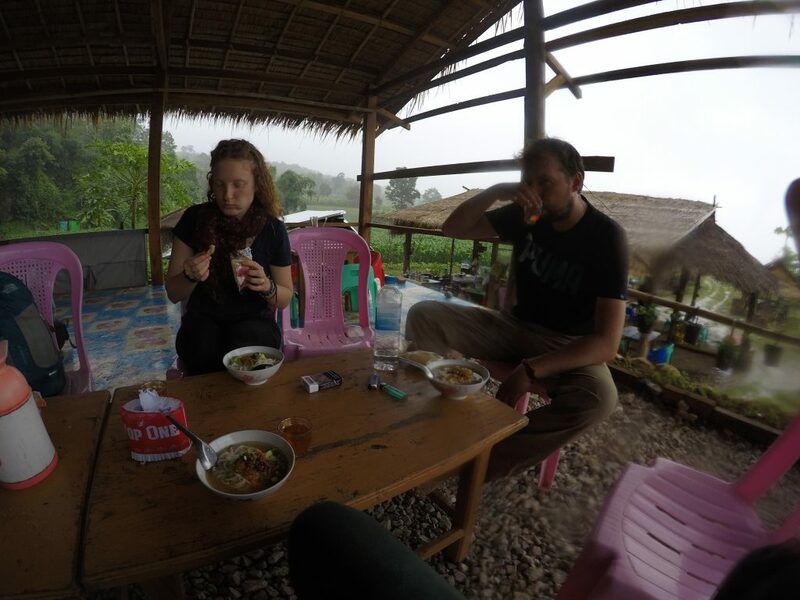 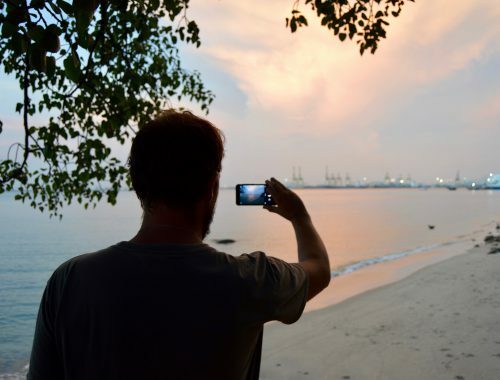 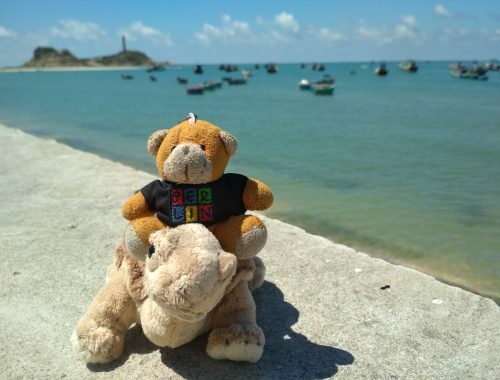 However, the scenery paid again of for that, but we were all happy when we finally arrived at the Tuk-Tuk Pick Up point that should bring us back to Mr. Charles Guesthouse, were we were happy to stay at and booked the tour. 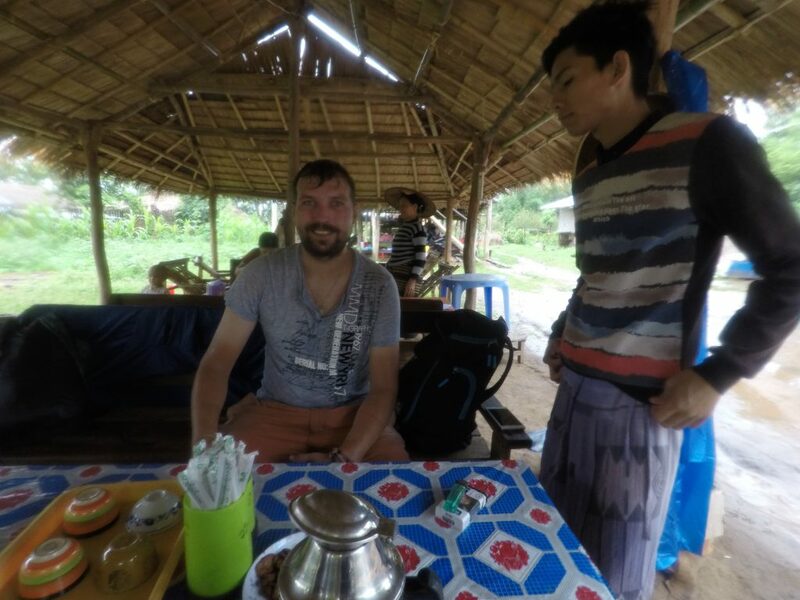 World Trip Berlin Tip: Compare the prices in Hsipaw, as they vary a lot. 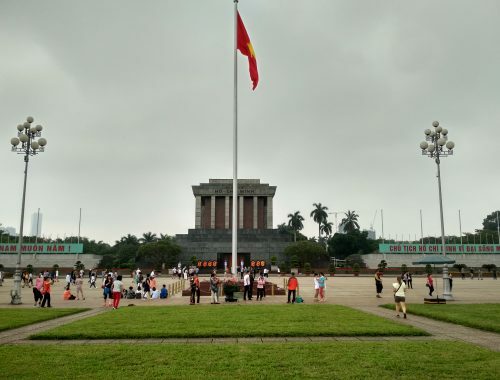 The most famous agency there seems to be Mr. Bike, but he wanted 85000 for a 3-day tour. 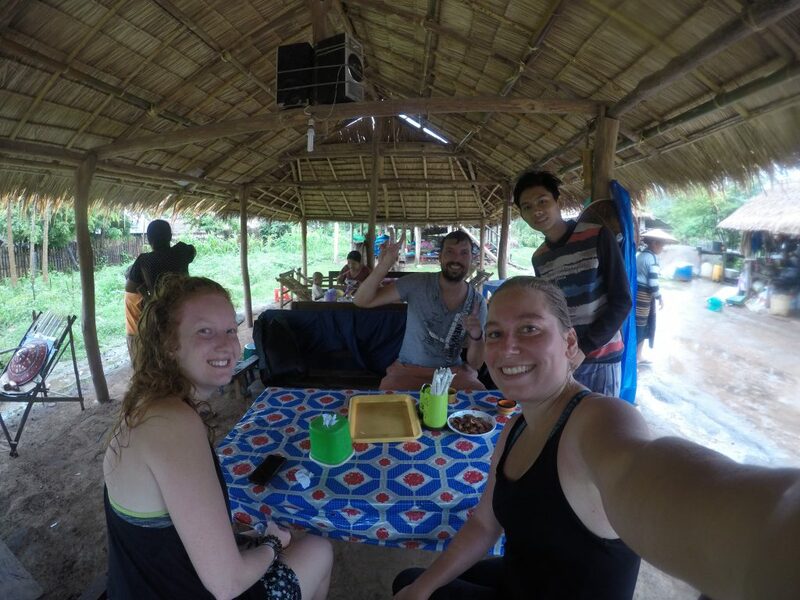 We paid 35.000 for the 2-day version directly at Mr. Charles and had a great time. 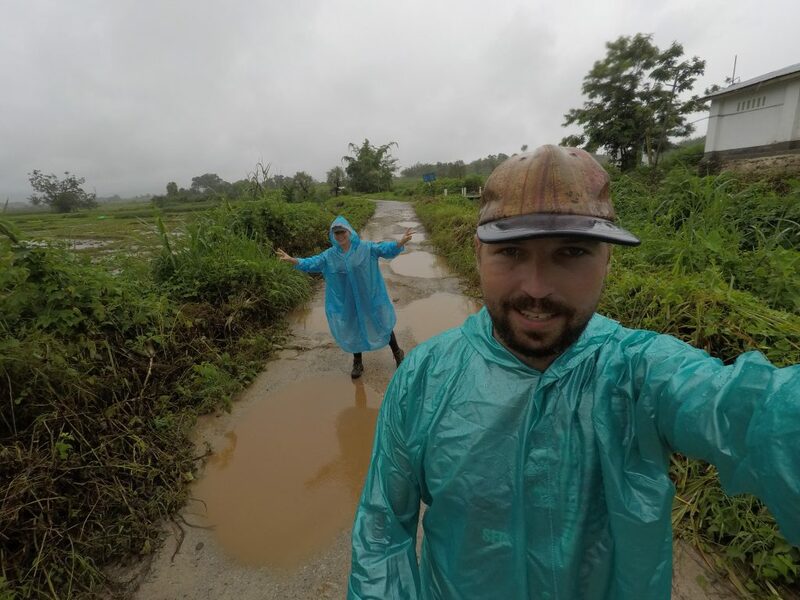 We even got 5000 back as we skipped a part due to the heavy rain, what we decided to give each as a tip to Hai, who was great! 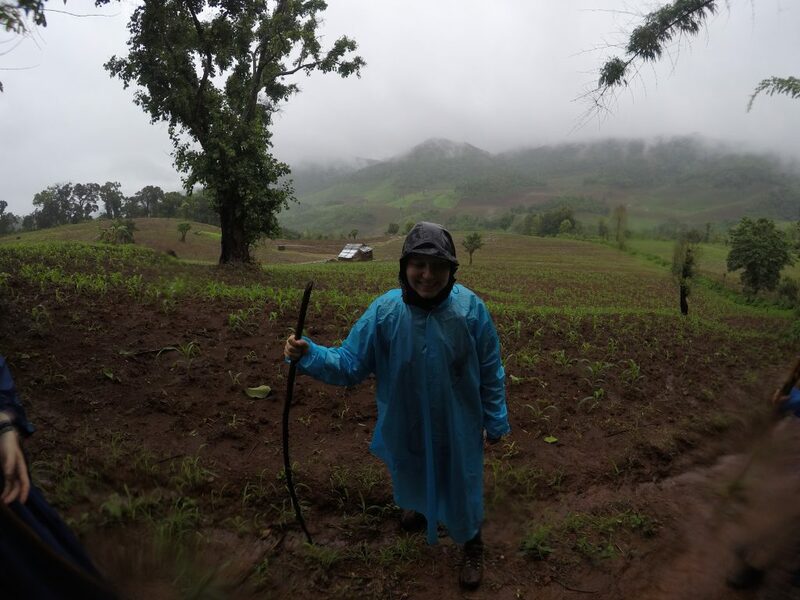 Thanks again Hai for the amazing time! 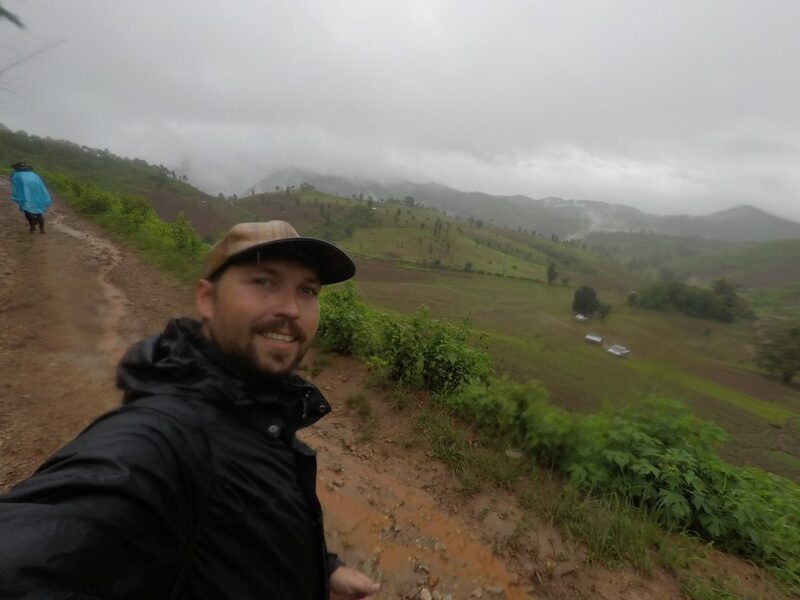 Hope to see you in the future in Myanmar, Germany or somewhere else on the planet! 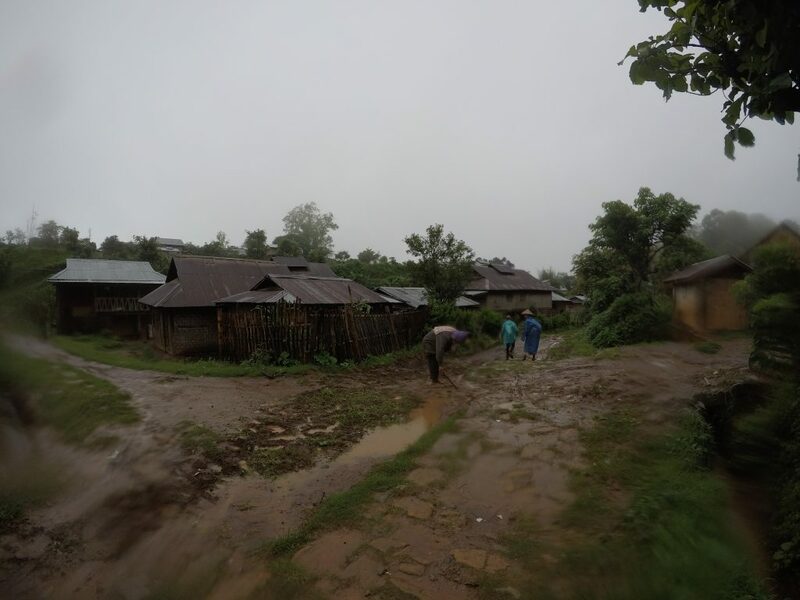 Please share your experiences, tips and tricks about Hsipaw in the comment section to help others!